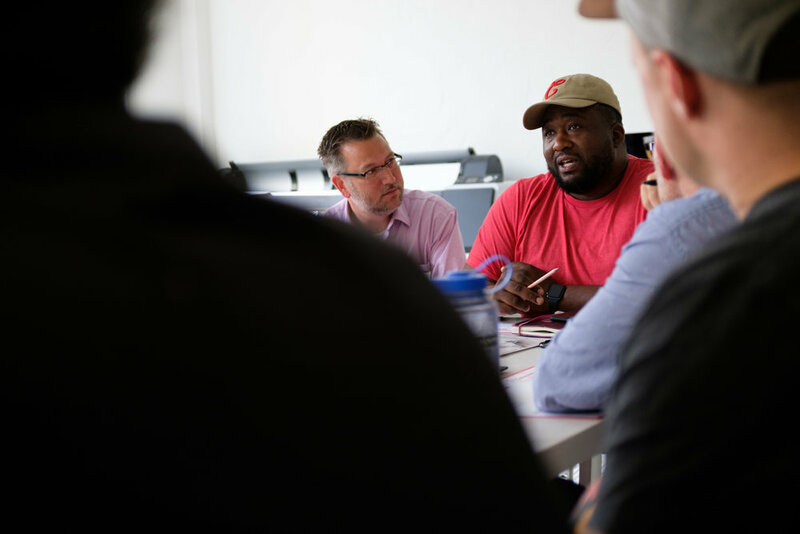 This past week, The Big Table brought together thousands of creatives across central Ohio to discuss initiatives and successful programs that address ongoing Columbus issues. Jeremy Slagle, a Rise and Design regular, and Thad De Vassie of the Joy Venture podcast hosted a roundtable at Yao Cheng Design’s studio (one of several hundred simultaneous discussions on in the city that day! ), prompting attendees to take a closer look at our community and identify ways we can help. As creatives, we are busy-body folks. We take on too many projects and can get a little lost in all of the hustle and bustle. "Bettering society" seems a daunting task. But, what if we are able to focus on something small, specific to our local community that feels achievable? And not only all of that, but something that we are excited about? The objective of these city-wide Big Table meetings is to unite people for the common goal of bettering and strengthening the community. "We started Big Table because creatives can solve problems the way no one else can," said Slagle. "They can look beyond numbers and programs and see people and opportunities." This is exactly what we did. Danielle Evans observed an issue in her own neighborhood, watching children from east of Parsons migrating en masse with their families to German Village / Schiller Park on Trick or Treat night. These children come in droves either because their neighborhoods don't participate or are deemed unsafe to walk at night. Conversely, residents of German Village can be resentful and unwilling to participate with trick-or-treaters from other neighborhoods. As a group, we turned our attention to the unspoken, but very present, divide existing between the racial and socio-economic barriers of hard line Columbus neighborhoods. How can families traveling outside their neighborhoods for safety or promise of better candy feel dignified in their pursuit? Could creatives blur the line between neighborhoods, fostering a sense of community that bridges Parsons and other dividing elements like this around the city? From this one question stemmed multiple ideas and perspectives - all different and all brilliant! A more straightforward solution offered by Dylan Menges would be to set up a central meet-up area between the two neighborhoods (i.e. a church parking lot, community recreation center, or school) where children and their parents can gather and get to know each other and build a level of trust with each other that does not currently exist. Possible pre-trick-or-treat activities include a bag decorating station and cardboard haunted houses, with refreshments and food for both the children and adults to enjoy! To take this idea one step further, someone also suggested creating starter kits for people to host these trick-or-treat receptions in their own neighborhoods. By providing starter kits for folks, it would create a sense of involvement and participation for the parents & kids that could also spark new ideas of their own. Ben Howes suggested a Pokémon-style city initiative where Columbus neighborhoods are given a monster mascot and a landmark partner - either a park or public building - to encourage trick-or-treaters from all neighborhoods to explore as many pockets of Columbus as possible. Participants collect stamps or stickers from homes in each neighborhood, trying to "catch them all." There were lots of great ideas put on the table (pun-intended! ), but we are still in the early phase of brainstorming. After all, we are a unique group of folks; we have the resources to not only come up with creative solutions but we also have connections to vendors, printers to see this project through. Next Big Table meeting will be open to anyone who's interested at our June 2nd meet-up from 11am-noon following our one year party for Rise & Design. A big thanks to Jeremy and Thad for organizing this year's event and getting local creatives together to talk/think about ways that we can contribute.